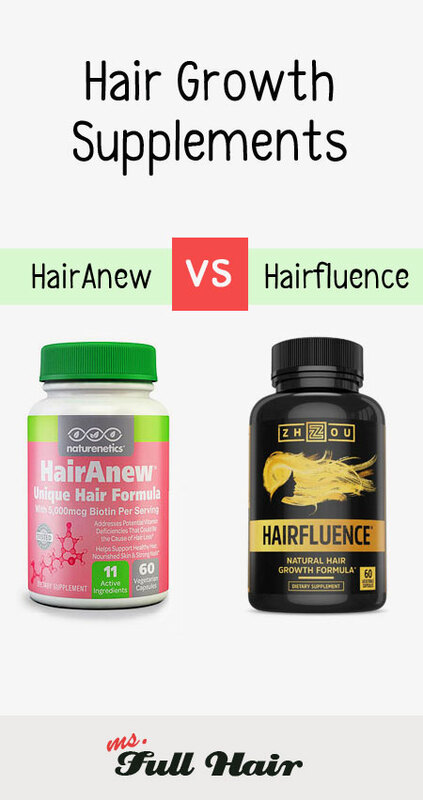 Hairanew vs Hairfluence - Which One Is Better for Hair Loss? We will compare everything, which will include a number of reviews and customer ratings, common and different ingredients, people’s positive and negative reviews, and finally which product you should choose for preventing hair loss and stimulating new hair growth. The most important part: ingredients. (Ingredients) What HairAnew and Hairfluence have in common? No surprise here. Both supplements include Biotin in their formulas. Biotin, as we’ve mentioned many times throughout the site, is a basic foundation for preventing hair loss. 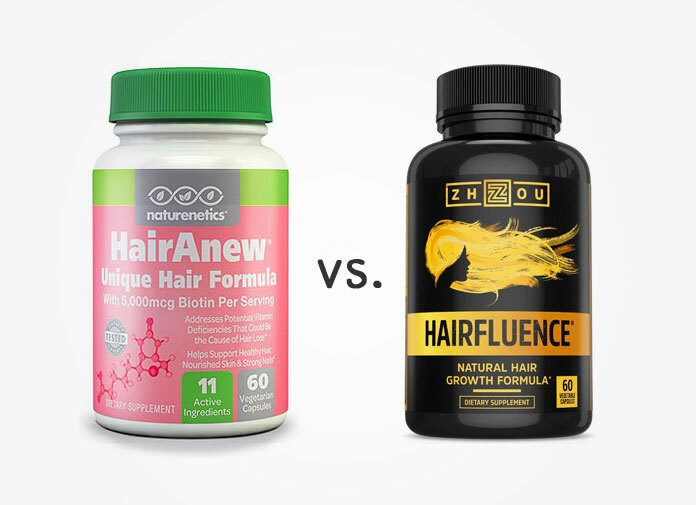 Both HairAnew and Hairfluence include 5,000 mcg of biotin per serving (2 capsules). 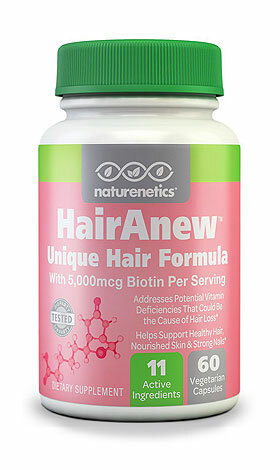 To be specific, based on independent lab testing by HairAnew supplements, there is an indication that HairAnew contains higher biotin content than claimed on the label (5730 mcg to be exact vs 5000 mcg on the label), which is a great sign considering you can even get 10,000 mcg biotin on the market! But either way, 5000 mcg of biotin is a great amount to have for people with thinning hair or those trying to prevent any excessive hair fall out. HairAnew contains 7.5 TIMES MORE Vitamin C than Hairfluence. As per the labels, the HairAnew vitamin has 750 mg of Vitamin C, while Hairfluence has 100 mg in the formula. So why is vitamin C important for hair growth? Other than the well-known fact that Vitamin C deficiency can lead to brittle hair and thus preventing proper hair growth, there was an interesting study done by Korean researchers at Kyungpook National University. The study finds that when researchers exposed ascorbic acid 2-phosphate (Vitamin C derivative) to cultured derma papilla (the center of hair bulb where it gets nutrition from our body to hair follicles), it had a stimulating effect on the derma papilla cells as well as promoting hair follicle growth. HairAnew vitamins contains 25 mg of vitamin B6, while Hairfluence hair vitamins has 5 mg per serving. Vitamin B6 is known for strengthening the immune system as well as boosting metabolism and balancing hormones. One of B6’s significant benefits for hair is to promote the maintenance of healthy skin and hair conditions. The deficiency of vitamin B6 can lead to dandruff issues or general hair thinning. A polish study conducted on 46 women confirms the fact that Vitamin B6 helps reducing diffused hair thinning. HairAnew includes 25 mg of Niacin vs Hairfluence has 5 mg.
Also known as Vitamin B3, Niacin plays an important role of healthy hair growth by stimulating blood flow to the scalp, according to a study by University of Copenhagen. Another great benefit of Niacin is building keratin elements in the Anagen phase (aka the hair-growth phase). HairAnew includes 40 mg of Pantothenic Acid, while Hairfluence has 100 mg.
Pantothenic Acid is also known as Vitamin B5. This water soluble vitamin works as a natural metabolizer by converting food into energy and nourishing cells, including hair follicle cells. Another benefit of Pantothenic Acid is about protecting pigmentation of hair and preventing premature grey-ing. Both HairAnew and Hairfluence have 20 mg of Bamboo 70% extract per serving. The main ingredient of Bamboo 70% extract is silica. Silica is a no stranger to the hair loss world. This trace mineral is known for helping all stages of development of our body by providing collagen synthesis. Silica is also known for improving blood circulation to and from the scalp. This in turn provides hair follicles the optimal growth environment for full nourishment. (Ingredients) What are the differences? Looking at the overall ingredient comparison chart on top, you can see Hairfluence supplement has more ingredients (Total 17) compared to HairAnew having 11 ingredients. Hairafluence contains the following ingredients, which HairAnew does not have: Vitamin A, Vitamin D3, Vitamin B1, Vitamin B2, Vitamin B6, Vitamin B12, Floate, Calcium. MSM, Collagen Hydrolysate, Hydrolyzed Keratin. What does this mean? 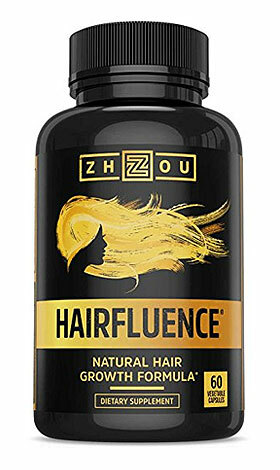 First, we really like that the Hairfluence supplement contains most of the Vitamin B complex family in their formula, which has direct relation to healthy hair growth. Hairfluence also includes a 400 mg of MSM, a compound popularly used among women for getting faster hair growth results. There are a couple of both published and unpublished studies in which both results show MSM’s direct relations to hair growth. One unique ingredient we noticed from Hairfluence hair vitamins is Hydrolyzed collagen. The company claims that it is a combination of 18 essential amino acids to generate faster and healthier hair growth. While HairAnew does not include the whole Vitamin B complex in their formula, there are a number of ingredients that make this supplement equally special – Zinc, kelp, inositol, and Ginko Biloba (Click here to read more details about each ingredient). All 4 ingredients are often-discussed herbs and compounds that have both direct and indirect benefits when it comes to preventing hair loss and promoting new hair growth. For instance, Ginko Biloba acts as a natural blood vessel widener. Its ability is known for stimulating proper blood circulation to the scalp, thus providing the essential nutrition your follicles need. There are also quite a number of studies on zinc, kelp and inositol for hair loss. So it’s great to see that HairAnew vitamins contains well-researched hair growth ingredients into their formula. PROS: There are hundreds of people experiencing new hair growth in thinning spots after taking HairAnew vitamins. You will also see many before-and-after photos from people with Alopecia, general thinning, and postpartum hair loss having great results with new hairs filling in those areas. What you will also love about HairAnew is the FREE PRODUCT for a first time purchase, which is a great way for anyone to continue taking the supplement without paying extra (how to claim a HairAnew Free sample). Their customer service also appears to be top-notch with a great refund policy and knowledgeable staff members. CONS: If you read the low ratings, you will find there is one thing that keeps coming up: skin breakouts. Also, there were people who reported no growth results in the negative ratings. PROS: Hairfluence also has numerous customer reviews as well as before-and-after photos from both men and women. We noticed many people mention that they started seeing hair growth as early as 2 weeks to 1 month of taking Hairfluence. Their customer service also appears to be really good. For instance, we read several people reporting capsule discoloration and the company immediately responded to such concerns. CONS: Skin breakout also appears to be a common complaint about Hairfluence. We also read reviews people having stomach issues, which you will often read from any other hair supplements. Lastly, there are also people seeing little to no results. Here is the summary: HairAnew contains 5000 mcg of biotin as well as a number of natural hair growth ingredients such as kelp, ginko biloba and bamboo extract that are known for improving hair loss and stimulating new hair growth (based on research studies). The company takes it a step further by performing independent tests on the purity of the formula in order to keep their supplement highly effective. In the meanwhile, Hairfluence includes all Vitamin B complex (Vitamin B1, B2, B6, B12, Pantothenic Acid and Niacin) that are crucial for hair growth on top of 5000 mcg of biotin and MSM. The formula also includes Hydrolysate collagen, which company claims 18 essential amino acids for faster and healthier hair growth. Both supplements in fact have similar patterns of positive and negative reviews. For positive reviews, people report new hair growth and reduction of hair shedding. For Hairfluence, more people seem to report faster hair growth. For negative reviews, both Hairfluence and HairAnew have one issue in common: skin breakout. Which one is better for hair loss? HairAnew or Hairfluence? Because the formula is somewhat different, choosing HairAnew vs Hairfluence becomes a personal preference. If you don’t want to miss all your vitamin B complex (known for promoting healthy hair growth and preventing hair loss), go with Hairfluence. Its variety of ingredients covers your vitamin B complex needs as well as MSM and bamboo extract. If you want to be safe, try the MOST reviewed hair loss supplement on Amazon (as of February 2018), HairAnew vitamins. The company uses the highest quality ingredients for their formula and it contains natural hair growth boosting components such as zinc, kelp, inositol, Ginko biloba and bamboo extract, which all are backed by a number of studies. Have you tried either hair loss supplement? Share your review below!